With Tom Petty and the Heartbreakers and Mink Deville. August 4, 1977 - Paramount Theatre, Seattle, WA. Approximately 1 1/2 x 2 1/4 inches. Ticket has a light top right corner crease. Our inventory consist mostly of one of a kind items that we do not have extras of, so when they are gone, they are gone! 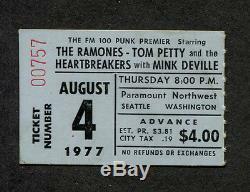 The item "Original 1977 The Ramones Tom Petty Mink Deville concert ticket stub Seattle" is in sale since Tuesday, August 18, 2015. This item is in the category "Entertainment Memorabilia\Music Memorabilia\Rock & Pop\Artists R\Ramones". The seller is "novakent" and is located in Las Vegas, Nevada. This item can be shipped worldwide.